it will not work until you have created a save file sorry but it need a writable root Dir. Mywolfe-008 big change is the addition of Xine-ui and fixed a few more of the menu item that were in the control panel and in the menu. I did remove a few small programs. Some of the best Extensions for Google-chrome can be found here. Another is AdThwart it Blocks ads on websites. Supports EasyList and many other filter lists. The last one I like is AdBlock for Chrome! Removes Facebook ads, Flash animations, and ads from all over the web. So please try it out and let me know if you like it or not. I just love the sea-surfing dog background ! * specified it was not a USB keyboard under "choose keyboard interface"
After setting the above the text editor and urxvt stopped being fussy and did accept my typing! Is there a bug in urxvt: it says there is no defaultdraw and no spreadsheet programs. Should it tell us? Apparently the rox pager only works if rox panel is horizontal? Besides, you can't set its height... which makes for a BBIIGG rox panel. I gather MyWolfe 0.08 is a "woof" build? What version of Puppy did you base your derivative on? Out of the box, it's an elegant and fun distro. Thanks for nurturing my favorite hobby! As for rox showing there is not default text editor and default spreadsheet is a error on my part I use Google doc and recommend Open-office for those that need a good office suite. I did not put it in this post but have said all along in order to get Google-chrome to work you must first create a save file. I downloaded your iso. I am using Pentium III 512 mb of ram, 40 gb hard drive. The iso loaded fine. The vertical sidebar and product arrangement was good. However the google-chrome reports errors and did not load. Your focus should make sure that the browser works at was the only one you have in your arrangement. Otherwise the look and feel of the applications was good. Especially I would think fora first time user. But in today's world the internet is predominant. And the Browser is access to it. I do agree with you that the internet is the most important thing to most people today using computer, in both of the bates I stated as clearly as I could that Google-chrome will not run until you have a save file. It has to have a fully writable root Dir and that can not happen until you create a save file and I do which someone with more knowledge of the inter-workings of puppy can look at this and find an answer for I am not a programmer just using woof to create and modify it to my likings. The Google Chrome browser will not run on this puplet until a save file has been created. Oops GrumpyWolfe you beat me to it! Cross posting now. I notice that that flash player crashes in Google Chrome at certain sites. I noticed that this occurs at sites that Opera 10 and flash player have issues. However, I do not experience flash player crashes in Google Chrome if Firefox is installed. I have tried 3 different flash players with the version of Google-chrome and have found the same thing. Maybe I should of stayed with the officeal beta for now but the 266 beta offered some bug fixes and well no one had said they where havening any real problems. Maybe the next Dev version will have a fix. Yep, you did state clearly. did I read it clearly :) no :) I am browsing the net with MyWolf and will try it out more now. Thanks. I tried compiling google-chrome myself for puppy linux 3.01 but I haven't done it much and was chasing dependency after dependency. We all have our program quirks, mine is the need for dosbox 0.72 to work as I use a DOS program regularly. I installed it and got the following missing lib which I couldn't track down. any advise welcome. OK, fot google chrome running, thanks. I used Gpassman extensively in Puppy Linux 3.01 is there a conversion utility to the new Figaros_password manager? Google Chrome is shaping up to be an excellent browser. Despite some of its as yet undeveloped features it does outperform Firefox admirably at times. It is fast and in my experience stable and eats far less cpu capacity at any given moment than the mozilla browsers (on my eeepc anyway). Thank you for compiling the new versions of the browser as they become available. I use them. I was able to copy the program over to its locations as well as the encrypted file. Added some GTK libs and was up and running with. 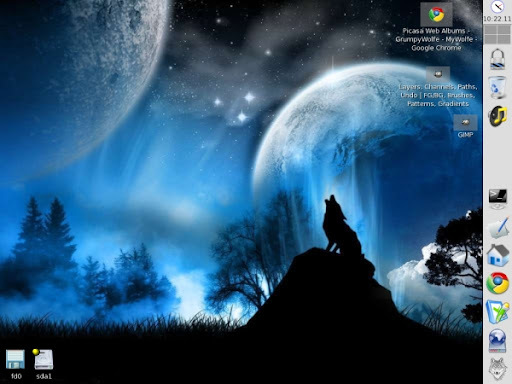 The MyWolfe is a nice program set. Working on adding skype now. Me too, there's a couple of DOS programs I still can't do without.